After 28 years, can Hillsborough survivors finally attain a sense of closure? John Hughson speaks to The42 about the legacy of this terrible tragedy. 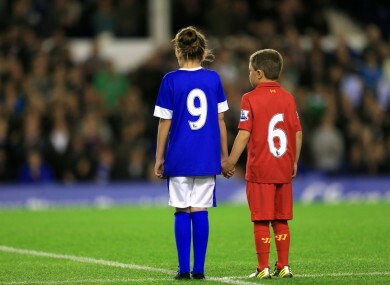 A young Everton and Liverpool fan pay tribute to the 96 people who died in the Hillsborough tragedy. JOHN HUGHSON WILL be giving a talk on The Hillsborough Tragedy as Cultural Trauma as part of a series of seminars on sport and politics with renowned international experts at the GAA Museum Summer School in a Croke Park event running from Thursday 29 June to Saturday 1 July. For info on how to buy tickets, click here. The42 recently spoke to Hughson about some of the issues dealt with in his paper, which focuses on the long-term consequences of the tragedy. What are your memories of Hillsborough and what prompted you to explore it further? I’m Australian. I’m 58 years old, so I was a man of about 30 when it occurred. I was in the early stages of an academic career in Australia. At that time, the academic part had nothing to do with it. You get the news over there of football results and other things. Of course, I’d got up in the morning as someone interested in English football to hear the result of who was going to be going through to the final only to hear this horrible news of the tragedy at Hillsborough. It came to me that way — not in the way of people in Britain or closer, events unfolding on the afternoon as you’re listening to that game or others. That’s got something to do with interest in my own position as an author of an academic paper that I wrote about Hillsborough. I was sort of wanting to look at it from a distance as an academic — it might sound a bit dry, but dispassionately, as much as one could on the outside. I’m not even English. I’m certainly not a Liverpudlian. I’m someone who is interested in British football and the various aspects of British culture. But it was put to me by the co-author of the paper, Ramón Spaaij, who’s a sports sociologist, originally Dutch, but who has worked in Australia for a number of years now, as to whether or not this terminology of cultural trauma has any traction to be able to explain the ongoing sense of a public feeling and a public grieving and a public hurt — the upset and the pain about the Hillsborough tragedy. He wondered whether we might apply this model and whether it helps us understand it in an academic or sociological way. With many tragedies, those associated with the victim can move on and put it behind them relatively swiftly in an ideal scenario. But Hillsborough is different, isn’t it, given that the inquest and the various controversies relating to it have continued for nearly three decades, meaning it’s virtually impossible for the survivors to ignore or forget about? We had this paper published in 2011 in one of the sociology journals and there’s a bit of a time lag between when you write things and when they come out. I remember working on this in the first part of 2010 — that was about a year after the 20th anniversary. We’d sort of looked at what was going on and there was quite a big deal being made of it in the media. There was a very painful magazine piece in a British weekend newspaper. It was incredibly difficult to read as someone removed from it. It made us think that 20 years after, it was being suffered in this way. The interest to us as academics came from that. This event was still suffered as a tragedy so long after. When you read the accounts, understandably so. So much of it had to do with the fact of blame. The blaming of the victims and the families of the victims. The victims themselves, people who were killed or people who were injured, people who were there. In a way, the blame continued — blaming the families and the people close to them who were wanting to say ‘this is not right’. They ended up being dragged into the blame process as well. They were being blamed for continuing on with a ‘victimhood’. A verdict was reached last year that the 96 victims were unlawfully killed, which was a key moment in this story, though there are still various issues to be resolved. Would it be right to say, though, that many of the survivors and people affected by the tragedy may never feel a full sense of closure? This is one of the things we were looking at and one of the reasons we wanted to use this cultural trauma model. I’ll just say a bit more on that as I come to answer your question. We use this cultural trauma model by a Polish sociologist, because it was an attempt to take a terminology, trauma, which has tended to be used to explain an individual plight and an individual suffering and an individual situation for loss of a family member or loved one or someone close to a person. But to be talking about it as a cultural trauma and to be talking about it in more of a collective and public sense — that’s why we looked at that model and wanted to get an understanding of this public grief and this shared grief that seemed to be experienced by people in this very shared way, and it bound them together. It’s a six-stage model that’s developed by the Polish sociologist Piotr Sztompka and the last one considers overcoming moving on — how and when does that happen. There’s no definitive answer to it. He suggests it can occur with time and some forms of closure occurring, which gets to the point you’ve raised. Does it occur for the people who have been grieving over Hillsborough? I can’t know the answer for certain, but one of the main things of the campaign that they’ve put together over the years has been justice for the 96 victims, meaning they’re not to blame for what happened to them. We know all about the background and that dreadful headline in The Sun, which was the catalyst for the terrible news reporting that was happening. So it was wanting to put that right, that’s come by increments over the years — the most current stage of that being the coronial inquest to 2016, where those deaths were found to be unlawful. It was fairly clear from their words and the images we saw of people applauding or celebrating in a way outside the court-house — they were reading the reports inside the court room, applauding the jury, so they obviously welcomed that outcome. Whether it can provide closure for them is another matter. It moves on to another stage as we speak. We await an announcement by the crown prosecutors on Wednesday the 28th and this will determine whether legal proceedings will take place against certain individuals — unnamed at the moment. People who have read the history of the Hillsborough tragedy can kind of work out who a number of those people (that potentially face prosecution) might be. That step would lead to the final step in a formal process, where people are possibly going to be criminally charged for what happened and maybe even more so, how they responded to it by trying to cover up events and their role in those events. So that would be a closure in a formal way. Does it really end all of the heartache? Probably not. The sort of thing that hasn’t helped over time is public figures revisiting Hillsborough in a critical way. We talk in our paper about the building in of stereotypes about Liverpudlian people and that sort of thing is hard to overcome. There’s the public level and also the things that people say in pubs and so on and so forth. So any sort of formal decision ends that, but we can’t know — as long as that (sniping) goes on and people get a feeling that it’s going on, it’s very hard to get definite closure on things. It was obviously a horrible tragedy, but can there be positives taken from the aftermath, in terms of how people mobilised and ultimately fought successfully for justice? You’d like to think so. Even quite recently — and I’m not stitching the two things together — but with the Grenfell Tower Tragedy of last week, we’ve heard the queen make a speech with the opening of the latest session of parliament announcing the introduction of an independent public advocate to look into that tragedy, but the public advocate importantly acting on behalf of the bereaved families after that disaster and to support them at the subsequent inquest. One might wonder — and I believe people have addressed this in the media — how much the lessons from Hillsborough have had an impact on that decision being made. Of course, it’s made in the Queen’s speech, but it’s come to her via the government. So yes, I do think that those people have suffered incredibly over the years. But more so in attendant with that, the work that they’ve put in tirelessly trying to get the word put straight has led to a set of outcomes, which would ensure that those sort of cover-ups won’t happen again. It’s sad that negligence happened to let that fire occur to working class, impoverished people in a fairly expensive part of London as it is. The way it is dealt with and not swept under the carpet is what now becomes important. There are parallels that have been made in the media between Hillsborough and Grenfell. Do you agree that there is a legitimate concern that we could repeat the mistakes of the past and that those responsible might use their power and influence to protect themselves? Yes, I think so and those of us who might have been attuned to that possibility could hear things (that alluded to Hillsborough) being said in some of the interviews straight after that tragedy occurred. Email “After 28 years, can Hillsborough survivors finally attain a sense of closure?”. Feedback on “After 28 years, can Hillsborough survivors finally attain a sense of closure?”.